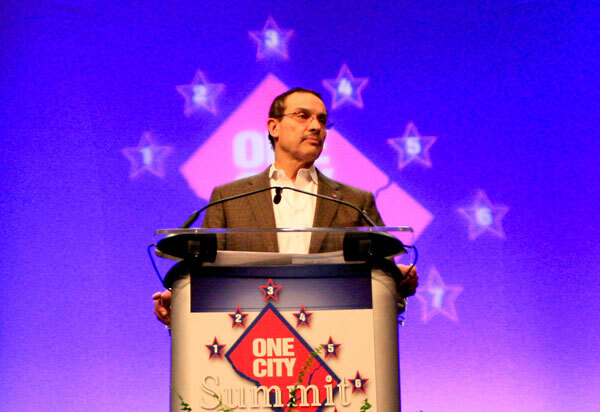 Mayor Vincent Gray, who faces reelection this November, has repeatedly denied involvement in the nearly $700,000 slush fund, which was financed by businessman Jeffrey Thompson in 2010. Vincent Gray’s future in the District was thrown into question this week after federal prosecutors said he was involved with a local businessman who ran the illegal campaign fund that buoyed the mayor’s 2010 bid. Gray has for three years fended off questions about the shadow campaign, which prosecutors revealed Monday was worth $668,800 – nearly the same amount of cash he has to spend for his reelection effort this year. Jeffrey Thompson, the businessman who created the illegal fund, pled guilty to two counts of conspiracy Monday, which included more than $2 million funneled into local and national political campaigns from 2006 to 2010. Still, experts predict that Gray can survive the scandal. He has been busily building up his support across the District, rallying supporters and raising more than $1.1 million since launching his campaign in January. “I don’t think I learned anything new this week that I hadn’t heard before or heard imagined before. At this point, unless more comes out to indicate that the mayor was involved in the situation I prefer to believe him over a plea bargaining guy who is a major lawbreaker,” said Ann Hoffman, a 22-year D.C. resident who has donated to both of Gray’s campaigns. Hoffman said she had considered supporting Foggy Bottom’s Council member Jack Evans or Busboys and Poets owner Andy Shallal, but she doesn’t think either has the experience to run a city. Norman Linsky, who has donated about $300 to Gray’s campaign, said he “wholeheartedly” supports the mayor and believes Gray when he denies knowing anything about the shadow campaign – a position he has continued to repeat. D.C. voters are not unfamiliar with scandal-ridden politicians. Four-term Mayor Marion Barry spent six months in prison for cocaine possession before winning a D.C. Council seat in 1992 followed by a fourth term in the mayor’s office. Mark Plotkin, an alumnus and contributor to BBC News, said he thought the allegations may have “energized” Gray’s base, and said Gray has a “good chance at winning” – unless he is indicted. Plotkin said Gray could eek out a win in April’s closed Democratic primary by securing a plurality instead of a majority. In a January poll by The Washington Post, Gray led the with 24 percent of the vote. However, the race won’t be decided in April now that At-Large Council member David Catania – a fiery independent who is white and gay – launched his mayoral bid Wednesday as the most high-profile challenger to April’s primary winner. The city has never had a white mayor or a mayor who is not a Democrat since home rule began in 1974. This article appeared in the February 13, 2014 issue of the Hatchet.